Greek Orthodox monk living by the Grace of God with ALS at Governeto Monastery, Chania, Crete. 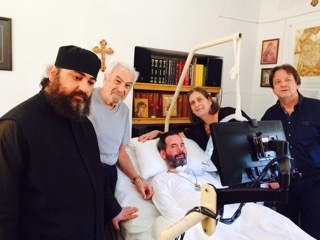 My name is Father Sophronios and I am a Greek Orthodox monk living with (Amyotrophic Lateral Sclerosis) ALS for the past five years on the island of Crete in Greece. I have great love and respect for people living with ALS (PALS) and for everyone in the wider ALS community. I want to share with you some of my experiences. Living with ALS is not easy -- that's probably the understatement of the year! But I have learned much from the disease. I am writing to you using a special program that allows me to write with my eyes. I am on a respirator and have a trach. I also have a feeding tube. I can't walk, talk, nor use my arms. So all the things I feared when I first received my diagnosis five years ago, I now live with. But I want you to know that I am happy and am very much alive. I don't consider myself exceptionally brave or strong; but, my happiness comes from a number of things, which I now share with you. First and foremost is my Christian Orthodox faith. Any strength that I have comes from God. And my belief in the eternal life gives me the courage to endure the difficulties I face today. Prayer allows me to commune with God and to look beyond the temporary condition and to contemplate the eternal condition. I thank God for many other things that sustain me. I share these with you knowing that I may be more fortunate than others, but encourage you, whether newly diagnosed or living with ALS for years, to adopt or cultivate some of things which I have found helpful. 1. A supportive environment: I live in a unique environment. I became a monk late in life, yielding to a calling to serve God and my fellow man. Shortly after becoming a monk, I was diagnosed with ALS. I live in a peaceful community of prayer. The 700-year-old monastery is perched high on cliffs overlooking the blue waters of the Aegean on the North-western peninsula of Crete. My brother monks care for me with love, compassion, understanding and patience. I urge you, if possible, to create a good supportive environment. 2. Loving family and friends: When I first learned of my diagnosis, I kept it inside of me for quite some time, not wanting to worry my mother, brother and friends -- what a foolish mistake! Once I opened up to my loved ones, the outpouring of love and affection has been a buoy which has kept me afloat ever since. I recommend you communicate often and early with loved ones and friends. 3. Exceptional caregivers: My brother monks are not trained nurses; however, they have learned all the essentials of caring for a person with ALS. In addition to my brother monks, I am blessed to have a wonderful nurse who has trained my other caregivers and has provided me with exceptional care. At first, caring for someone may seem daunting; especially in the later stages when machines are in place, but the practical aspects of care are learnable and the key ingredient of all for exceptional care is LOVE. If possible, find caregivers who have compassion for others. 4. Compassionate physicians: When I was at the early stages of ALS, I was able to travel and met with some of the best ALS doctors in America and England. I was grateful for their expertise, time,and patience. Here on Crete there may not be the same experience with ALS, but I have been blessed with very caring doctors. These doctors drive up the winding mountain roads to visit me at the monastery. I am grateful to all for the sensitivity, compassion and interest in making me as comfortable as possible and for meeting all my medical needs. Please seek out physicians who will go beyond the typical protocols and see you as a person first. 5. Excellent technology: I have had the blessing to be able to have access to some great technology: a very good wheel chair; a comfortable air mattress; a wonderful computer system; and all the necessary machines to keep me breathing comfortably. Plan early and anticipate your future needs. 6. Great nutrition: Living on Crete, I follow what is called a Mediterranean diet. I have mostly fresh, seasonal fruits, vegetables, lots of olive oil, yogurt from goat's milk, free-range chicken, eggs, fish and herbal teas. And now that I have a feeding tube, I maintain the same diet; all is well blended and easily passes through my feeding tube. I chose to forego the ready-made food supplements. I eat real foods and digest them well. I have regular blood work with normal, healthy results. I hope you will consider the importance of good nutrition. 7. The beauty of nature: I am not as mobile as I used to be, but I am blessed to be in a wonderful natural setting. I drink up as much of the nature that surrounds me. I take joy in the sun's rays, the blue sky, the chirping of birds, and the view of the mountains, the sound of rainfall, and many other gifts that God presents us in His creation. All of these wonders take on new meaning for me. Many of my friends send me photographs that fill my screen with beautiful images of nature; this brings me much joy. Whether it be nature, music, or favorite pets surround yourself with things which give you joy. 8. Communication: Although I may have lost my voice, I have not lost my ability to communicate. Thanks to my computer system I am in regular communication with friends and loved ones. I feel alive through this communication. I have meaning and purpose. I don't feel closed in or cut off. Please don't shut down; open up to others -- communicate. 9. Prayer: I believe in the power of prayer. It lifts me up and allows me to be connected to God. I pray for others. I pray for all who suffer from ALS. I pray for their families. I pray for the doctors, caregivers, and the many committed to finding a cure, such as the Byers. Although I suffer with this disease, I know that there are many who suffer more than I and I pray for them. I hope your faith and beliefs bring you comfort and allow you to go beyond the self. 10. Have a sense of purpose: One of the things I am most grateful for is that the disease has not affected my mind. Most who are stricken with ALS remain extremely cogent. I believe, therefore, that we can use that mind to remain stimulated, to help others, and to have a sense of purpose. Please don't look at what you can't do, but what you can do. I also want to thank ALS Worldwide for their heroic dedication in supporting all of us. ALS Worldwide is a non-profit organization based in the United States that advances promising research and provides free personal support via videoconference, email, phone and in-person visits to people living with ALS and their loved ones in more than 85 countries. Stephen and Barbara Byer founded ALS Worldwide in 2008 shortly after their son Ben, a documentary filmmaker, passed away from the disease at the age of 37. I had the good pleasure of being introduced to the Byer family through our mutual friend here in Greece, Anthony Papoulias, whose late wife and always beloved PAL, Annie can be seen with Ben in his significant film, Indestructible. I especially want to thank Sarah Byer, ALS Worldwide's Director of Outreach and Counseling, who is always there to answer any question I might have. I encourage PALS and their loved ones to visit ALS Worldwide online at alsworldwide.org and on Facebook and Twitter to learn more about the organization that has helped me so much. (Pictured Left to Right) The Abbot, Stephen Byer, Father Sophronios, Barbara Byer, Professor Achilleas Gravanis. Photo courtesy of ALS Worldwide. Communicate with friends and loved ones when you suspect something is wrong with your health and certainly when you receive an ALS diagnosis. I regret I didn't do that from the beginning. I delayed in getting a feeding tube and I waited too long. I lost too much weight and became very weak; my weakness caused complications to my respiratory system and most likely contributed to my needing a trach. Don't neglect physical therapy. I was not regular with my physical therapy and this resulted in my having some aches, pains, and discomfort I could have avoided. My heart goes out to all of you. I hope that something I have shared may be helpful. If you would like to communicate with me, you may email me sophrony@ymail.com. God bless you all. Stay strong; share your love with others, and pray for a cure. This article was originally published on the ALSworldwide website.